SCOTTSDALE, AZ and SALEM, MA--(Marketwired - Jan 13, 2015) - EVantage USA, Inc., exclusive marketers of Polaris®-branded electric bicycles, has teamed up with NFL great Jim Brown for Legends of Football Event January 29-30, 2015, a mega charity fundraiser in conjunction with Super Bowl XLIX to benefit national programs of the Amer-I-Can Foundation. The non-profit organization founded by Brown helps enable individuals to meet their academic potential and improve the quality of their lives. "We didn't hesitate one bit when asked by Jim Brown to participate in his annual charity fundraiser. We were humbled to have the interest of this legendary football icon in our bike line-up. We're proud to do our part and very pleased to support him as he raises funds for the great programs supported by his Amer-I-Can Foundation," said Adam Rand, President of EVantage USA, Inc., engineers and developers of the Polaris electric bicycles line. "We are donating some of our most advanced, sophisticated models -- retail values from $2,500 to $4,800 -- for fundraising events the days before Super Bowl XLIX. We are expecting great turnout of many of Jim's former NFL colleagues, and certainly anticipate his fundraiser will be an overwhelming success." According to Mr. Rand, "A fleet of Polaris electric bikes will be centrally featured in promotional events in Phoenix preceding the Super Bowl. Company representatives will be offering demonstrations and education on the benefits of their power assisted bikes." Amer-I-Can was founded in 1988 by NFL Hall of Fame recipient, Jim Brown, to help enable individuals to meet their academic potential, to conform their behavior to acceptable society standards, and improve the quality of their lives by equipping them with critical life management skills to confidently and successfully contribute to society. The 2015 Polaris eBikes line-up features groundbreaking technology including Gear Speed Technology, Active Trail, and Back Pedal Regeneration. Commuter, Mountain, and Fat-Tire models offer power speeds ranging from 15 mph to 25 mph, providing a range of up to 50 miles per charge depending on the model. EVantage develops electric vehicle technology. The company designs motor systems using proprietary technology setting the standard for a new class of electric vehicles. EVantage specializes in engineering, design, manufacturing and software development of the complete motor system. Facilities are in Salem, MA, Ft. Lauderdale, FL, and Stuttgart, Germany. Please visit www.polarisebikes.com. Polaris and its vehicle body designs and names are registered trademarks of Polaris Industries, Inc. used under license. Polaris designs, engineers, manufactures and markets snowmobiles, all-terrain vehicles (ATVs), Victory motorcycles and the Polaris RANGER for recreational and utility use. Information about the complete line of Polaris products, apparel and vehicle accessories are available from authorized Polaris dealers or anytime from the Polaris home page at www.polarisindustries.com. 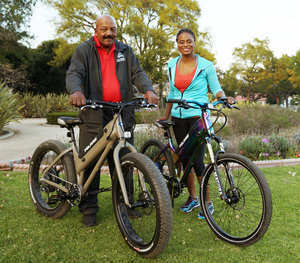 About this company EVantage USA, Inc.
NFL Hall of Famer Jim Brown, and his wife, Monique, get ready to test ride the Polaris® Sabre Fat Tire (left) and the Limited Edition Diesel electric bikes donated by EVantage USA to raise funds for Brown’s charity, Amer-I-Can.